COLLEGE PARK, MD--(Marketwired - Apr 23, 2015) - A multi-phase, multi-year renovation that brought dramatic changes -- including a new name -- to College Park Marriott Hotel & Conference Center is now complete. "We've changed everything to present an enhanced guest experience, whether you are here for a business meeting or wedding, or to visit the local community and D.C. attractions," says Mike McCarthy, General Manager at the College Park, Maryland hotel. Completed in April 2015, the final phase features 126 spacious, newly renovated hotel guest rooms. The design, by architectural firm HKS of Dallas, repeats the sleek, comfortable décor of 111 cozy guest rooms and executive studios in the Conference Center that were renovated during an earlier phase in 2013. 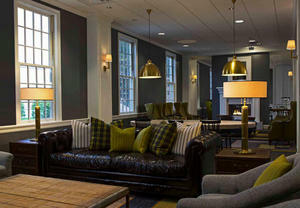 The centrally located College Park, Maryland hotel features rooms in a soothing palette of navy, green and crimson; built-in custom storage and work areas; iHome keyboard docking stations; and art inspired by the collections of the hotel's owner, the University of Maryland University College. Approximately 76 tubs have been removed to make way for showers in new tile and marble bathrooms. Perfect for guests attending corporate or social events in the conference center, the Concierge Lounge now has a complimentary computer station for printing boarding passes, checking e-mail or making your next Marriott reservation. The Presidential Suite was completely redone adding a contemporary new design, wet bar and a powder room for the parlor and enlarged bathroom in the bedroom portion. A stunning meeting/dining table and chrome accents complete the suite's décor. The main lobby also received notable upgrades and digital way-finding displays will be added soon. In 2014, the hotel's name was changed from Marriott Inn and Conference Center University of Maryland University College to reflect its new, streamlined décor and technology designed to meet the needs of the modern mobile, social lifestyle. College Park Marriott Hotel & Conference Center is located at 3501 University Blvd, East in Hyattsville, Maryland. The University of Maryland hotel is centrally located in College Park, Maryland, adjacent to the UMD campus and near the famous Byrd Stadium. The hotel's location is also convenient to the U.S. Food and Drug Administration's White Oak campus and close to the College Park Metro Station with quick access to Washington, D.C. A popular choice with business and leisure travelers, it features complimentary WiFi in all guest rooms and free parking. For reservations and more information, call 301-985-7300 or visit http://www.marriott.com/hotels/travel/wasum-college-park-marriott-hotel-and-conference-center/. Follow College Park Marriott on Facebook and Twitter. College Park Marriott Hotel & Conference Center finalizes their multi-phase renovation, including updates to the guest rooms, meeting spaces, and public areas.